Cries of “There’s Piper!” could be heard from staff and visitors alike at the Pelham Library, Fonthill branch, this past Friday as Piper and her owner Pam Young arrived. Piper, a grey terrier-mix, made a beeline for the group of ladies who sat with their knitting projects in front of them. It is part of their weekly routine on the way to their regular library session, Paws with Piper. The program runs every Friday from 3:30 PM to 4:15 PM, and visitors are encouraged to stop by the library to visit with Piper to relax and relieve stress. The library also offers a six-week program in the summer that gives children the opportunity to read stories to Piper. Piper and Young are affiliated with Therapy Tails Ontario, a non-profit charity that certifies therapy dogs and arranges for them to visit various locations, with the goal of improving the lives of those they encounter. 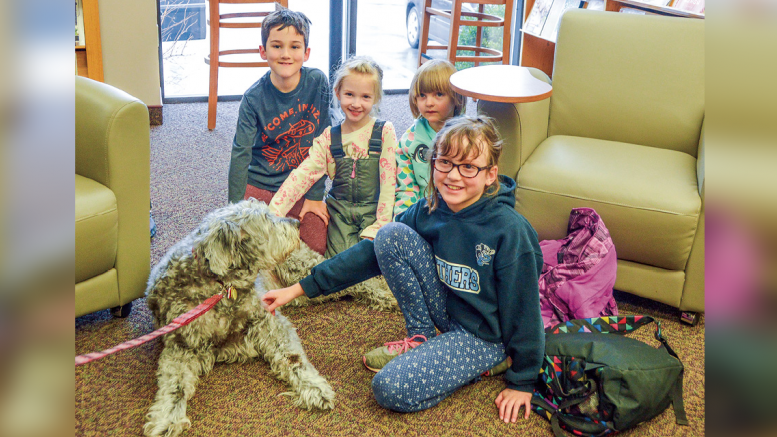 The Paws with Piper program, which has been going on for three years, started when Young approached the library with the idea. She had seen how well those in her apartment building had responded to visits with Piper and wanted to share Piper’s “wonderful gifts” with others. Young went through the steps to get Piper certified as a therapy dog and arranged to start taking her to the library. Since then, the program has attracted some 5-20 participants each week. Adult Program Coordinator Melanie Taylor-Ridgway stopped by briefly to check in on the group and mentioned that Piper’s visits usually attract a “wide variety of ages.” Everyone from kids to seniors stop by to see the dog. Last Friday, attendance was on the lower end, with only a handful of guests stopping by. Young met each guest by name, and kept up friendly conversations with everyone, catching up on their week, and asking the children how school was treating them. Among last week’s visitors was Lydia, age 11, who has been coming every Friday for a year. Though Lydia was Piper’s primary visitor, others stopped by throughout the hour to have a quick chat with Young and to pet Piper quickly before they headed out again. The librarians themselves are included in those who enjoy Piper’s visits. “The girls here refer to Piper as their resident therapy dog,” said Young. In addition to the regulars, other children approached Piper for the first time on Friday, some with exclamations of “Wow!” and “Pretty dog!” A laid back character whose movements were mostly paw raises to get people to continue petting, Piper is also acknowledged by the librarians as an approachable dog for people who have not been around animals before. Many visitors are local, but every now and then folks show up from father afield than Pelham. “Last week we met a lovely gentleman, and his daughter, who had come over from England,” Young said. The group split-up slowly after their hour had passed, with promises to see one another again the following week. Although the duo have a scheduled time each Friday, it is likely that they will stop by before then. Young and Piper often drop in to say hello and to attempt to improve everyone’s day.